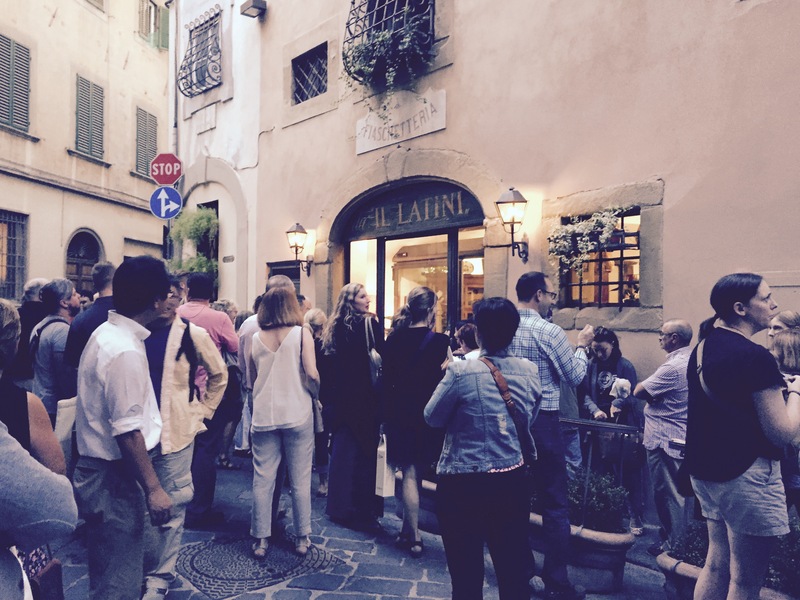 Last night we revisited Il Latini, a favorite restaurant from our last stay in Florence that serves traditional Tuscan dishes. 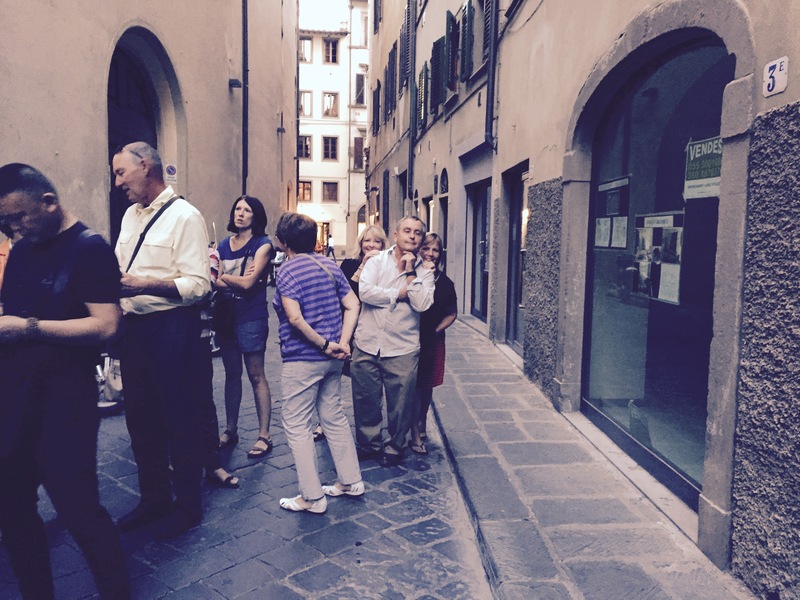 Five years ago we didn’t have a reservation but took our chances in the long line that forms before they open. This time we had a reservation and felt more confident we would get in as we joined the waiting line of hopeful diners. We were at the end of the longest line until we realized we could get in a different line because we had a reservation. Getting through the door and being escorted to our table felt like going to a big Italian party. The four of us were seated in the courtyard at a table with a huge bottle of wine and encouraged to drink as much wine as we wanted. 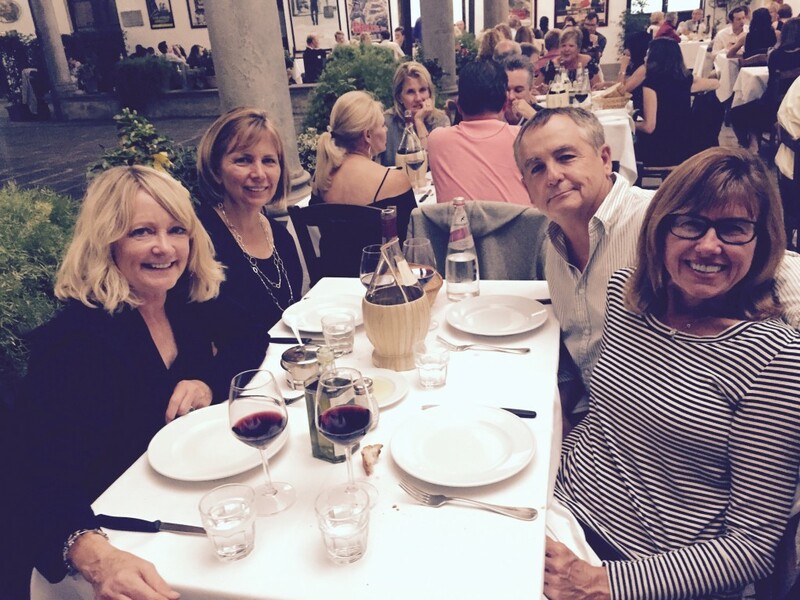 Soon after we sat down, our three-hour Tuscan feast began. The restaurant selected the dishes and served them family style. We started with antipasti of prosciutto and melon, caprese and some kind of grain salad that we couldn’t identify but loved. The primi consisted of three kinds of pasta with three kinds of sauces: pomodoro, bolognese, and rabbit. 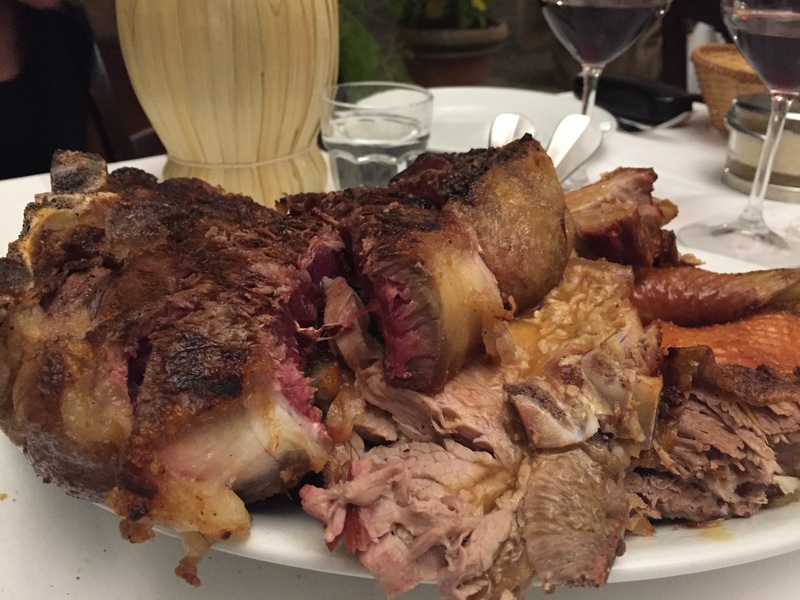 Florentines take preparing and eating meat seriously, and the secondi was more meat than I have ever seen on one table: Florentine steak, veal, chicken, lamb and pork. Not being a big meat eater, I was a little worried about this course, but I tried everything and it was tasty. The contorni were sauteed spinach, roasted potatoes and beans. Then we started our four-course dolci. 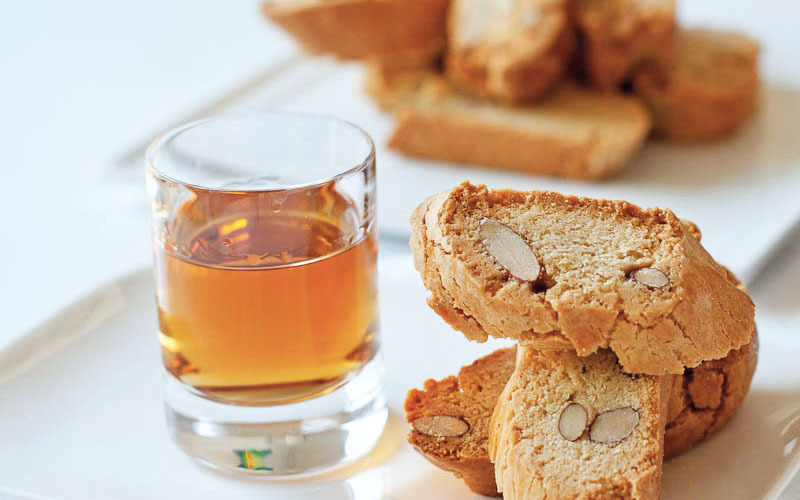 First they brought a plate of biscotti and small glasses of the Tuscan dessert wine vin santo. Vin santo, saint’s wine, has been made since the Middle Ages and comes from grapes harvested in the fall and air-dried on straw mats until the start of Holy Week. We dipped the biscotti into the wine. The star of the dolci show was a tray of four desserts: Tiramisu, almond pastry, raspberry tart and Tuscan grape harvest cake, a traditional dessert made at grape harvest time. A glass of Moscato and then a glass of Limoncello completed our lovely meal. We especially appreciated the lovely walk back to our apartment. 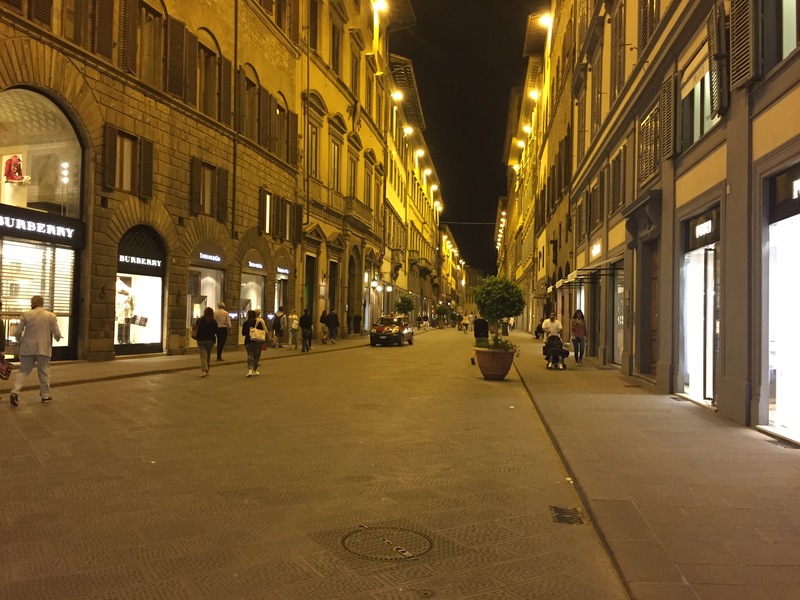 This entry was posted in Italy 2015 on September 11, 2015 by debbie.